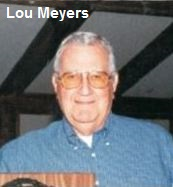 Longtime MSBL World Series Umpire in Chief, Lou Myers passed away July 20th in Mesa, Arizona. He was 88 years old. Lou is a member of the 2003 class of the MSBL World Series Hall of Fame. Lou died of complications from pneumonia and a serious staph infection. He’s been in hospice since January. He was surrounded by his family, including his wife, Jill, his three daughters Dorie, Suzanne and Connie along with several of his grandchildren. Last summer Lou visited his childhood home in Paducah, Kentucky and while there decided that he wanted to be cremated and his ashes spread on the farm he grew up on. For those of us fortunate enough to know and work with Lou over the past 30 years we are counting our blessings. He was an outstanding human being and wonderful person and a consummate professional and a person who everybody loved. No challenge was too great for Louis. He excelled when things looked bleak. There was never a better customer service guy than Lou! Lou was a great basketball player in college and spent time with the Washington Generals (the Harlem Globetrotters opponent) briefly after graduating before joining Delta Airlines. He helped former President Harry Truman (when he needed a Jack Daniels cocktail) and was good friends with many of the Chicago Blackhawks, including Bobby Hull and Stan Mikita. When Lou moved to Arizona 40 years ago Lou fell in love with the place. He loved to play golf and mingle with the locals. When Lou signed on to run the MSBL World Series umpires our ranks swelled. Because of him we picked up many new umpires, who weren’t just good at their jobs but top notch people. Just like EF Hutton, when Lou spoke, you paid attention! There’s no doubt in my mind that Lou made our umpire organization what it is today. In his final years Lou’s health took a turn for the worse while a botched back surgery two years ago really left him in pain. This doesn’t make his departure any easier for us, but it does allow our friend to head to a better place! Details on Lou’s services are being assembled. We will post those details when available.